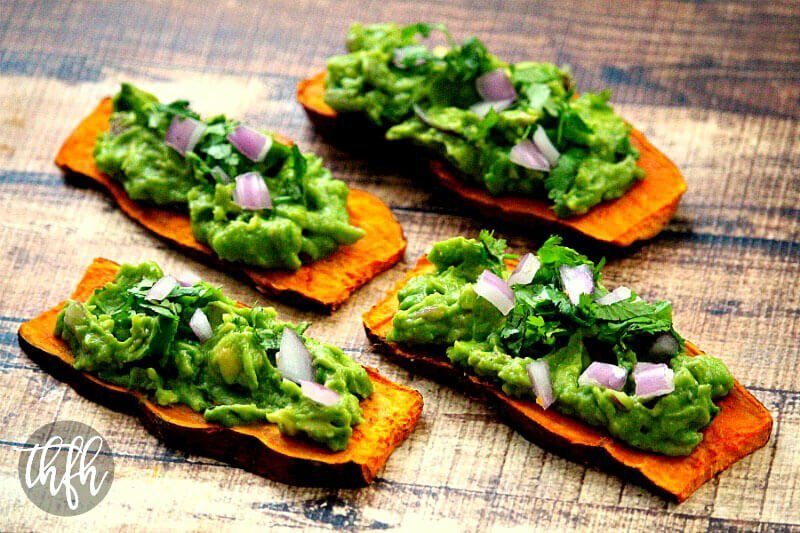 This Gluten-Free Vegan Oven-Baked Sweet Potato “Toast” with Spicy Guacamole is my recipe for the August 2017 Recipe Redux theme and is so good! So for my submission, I’m sharing a filling and nutrient-dense savory breakfast made with energy-boosting sweet potatoes and healthy fat from avocados and fresh veggies that will keep you satisfied all morning long. It doesn’t take long at all to throw it all together, but if you make the sweet potato “toast” in the oven, like I like to do, you can be taking care of other morning business while it’s baking in the oven. If you’re in a hurry, you can also make the sweet potato “toast” in an actual toaster, like a piece of bread. You’ll just need to slice it the same size and “toast” it on high in a regular toaster, running it through 3-4 times (flipping over each time) until the inside is soft. Either way you choose to make the sweet potato, the guacamole can be made in under 5 minutes (or even pre-made in advance) and you can adjust the amount of spicy to your preference. For example, if you were serving to your children, you may want to omit the jalapeno. This healthy, plant-based breakfast is made with real food ingredients and is vegan, gluten-free, dairy-free, nut-free, lectin-free and alkaline. Want more healthy recipes? Check out Vegan Cheesy Scalloped Potatoes, Spicy Red Pepper and Spinach Sweet Potato Hash Browns, Garlic and Shallot Fingerling Potatoes or my Clean Eating Cookbook with over 140 healthy, clean eating recipes just like this one that you will love! Cut both end off the sweet potato. Slice the sweet potatoes from top to bottom in 1/4 inch thick pieces. You should have 4-6 slices using a large sweet potato. Place the sweet potato slices on a baking pan lined with parchment paper. Lightly brush both sides with avocado oil. Bake at 350 degrees for approximately 30 minutes. Flip the slices over and continue baking for an additional 15 minutes. Remove from oven and prepare for assembly. 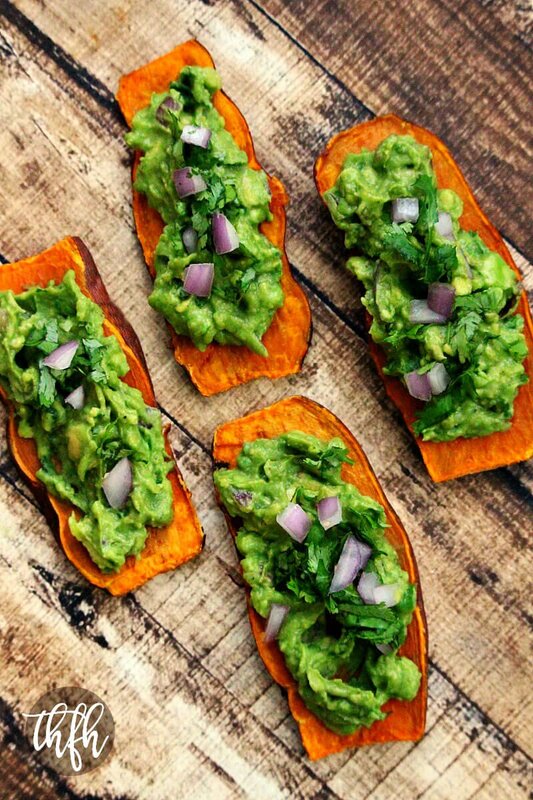 While the sweet potato slices are baking, prepare the guacamole by adding all ingredients for the guacamole to a small bowl and mash it together with a fork until it gets to the consistency you prefer. Adjust seasonings to your preference. 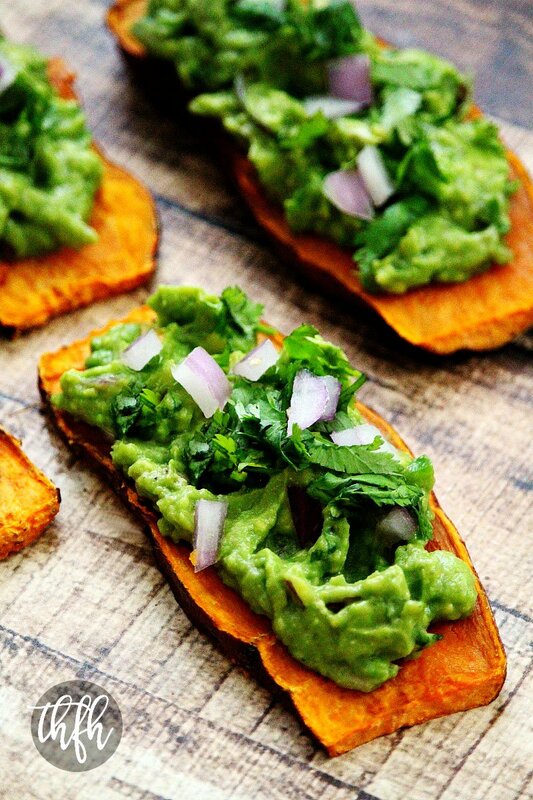 Transfer the sweet potato slices to your serving dish and top with 1-2 heaping tablespoons of guacamole. Optional: Garnish with additional chopped cilantro and/or red onions. The recipe and photographs for "Gluten-Free Vegan Oven Baked Sweet Potato "Toast" with Spicy Guacamole" by Karielyn Tillman of The Healthy Family and Home website are licensed under a Creative Commons Attribution Non-Commercial No Derivatives 4.0 International License and cannot be used without my written permission. Gorgeous photos! Love all your fast facts too!